The File palette contains buttons for loading, saving, importing and exporting a variety of files in a variety of formats — Projects, Documents, 3D objects, Timelines, Spotlights, textures and alphas. The File Open button will open an previously saved Project (ZPR format). Projects will save everything that is present on the document at the time of saving. The Save As button will save everything that is in the document into a Project. This will even safe the Tool and All Subtool(9s) along with their position. The Revert button restores the current Project to its condition when it was last saved. ZBrush first asks you to confirm this action. The Lightbox>Projects button gives instant access to the Projects tab in Lightbox. Pressing the Project Notes button will display the notes that have been saved with the current project. If no notes have been stored then this button will be disabled. The Edit button allows you to add or edit notes for the current project. The Open button opens a saved ZBrush document (ZBR format). Identical to the Open button in the Document palette. 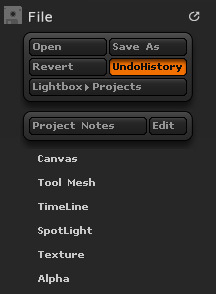 The Save button saves the ZBrush document. Identical to the Save button in the Document palette. The Revert button restores this document to its condition when it was last saved. ZBrush first asks you to confirm this action. Identical to the Revert button in the Document palette. Save As enables you to save this document to a file using a different name. Identical to the Save As button in the Document palette. The Load Tool button opens a saved ZBrush tool (ZTL format). Identical to the Load Tool button in the Tool palette. The Save As button saves the selected Tool. Identical to the Save As button in the Tool palette. The Load button opens a saved Timeline file (ZMO format). Identical to the Load button in the Movie > Timeline menu. The Save button saves the current Timeline settings to disk. Identical to the Save button in the Movie > Timeline menu. The Load Spotlight button opens a saved Spotlight file (ZSL format). Identical to the Load button in the Texture palette. The Save button saves the current Spotlight to disk. 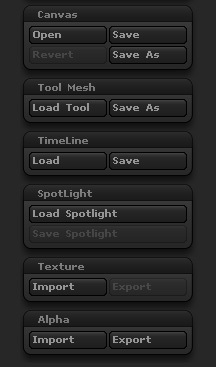 Identical to the Save Spotlight button in the Texture palette. The Import button loads a texture from a saved file. ZBrush recognizes a number of standard image formats for import and export. Identical to the Import button in the Texture palette. The Export button saves the current texture to an image file. ZBrush recognizes a number of standard image formats for import and export. Identical to the Export button in the Texture palette. The Import button loads an alpha from a saved file. ZBrush recognizes a number of standard image formats for import and export. Identical to the Import button in the Alpha palette. The Export button saves the current alpha to an image file on disk. ZBrush recognizes a number of standard image formats for import and export. Identical to the Export button in the Alpha palette.